Sure, the Golden State Warriors have Stephen Curry and Klay Thompson. But they also have a 10-year-old singing sensation from San Jose who the team is calling its "good luck charm." The Golden State Warriors have won every playoff game this season at which Nayah Damasen has belted out the national anthem. And the young powerhouse with the rocking vibrato sang again on Thursday at Oracle Arena to kick off Game 1 of the NBA Finals between the Warriors and the Cleveland Cavaliers. The Wariors won: 108-100. Nayah, who is home-schooled through Connections Academy online charter school so that she can pursue acting and singing lessons near Los Angeles, has been touching people’s hearts since she began singing Disney songs at home when she was a toddler. “I was like, 'Whoa, she’s good,'” said her mother, Mardi Damasen. But Nayah's first foray singing for the Warriors was when the team asked her to perform before a game in 2013 when she was 8. Someone who saw her sing at a charity event had recommended her to the team. Since then, she’s pounded out the “Star-Spangled Banner” about a dozen times for the Warriors, Damasen said. And each time she’s sang, the team has won, "except for once" against the San Antonio Spurs in 2013. One of the last times Nayah sang for the Warriors was in April, when the Dubs beat the New Orleans Pelicans. As she sang, rockets went off, red lights flashed and the crowd roared with delight. While Nayah loves basketball, especially playing it, she’s sang at plenty of other sporting events, too. Of her siblings, 13-year-old brother Noah and 8-year-old Nikaela, Nayah is the one with a voice like her grandmother, who was asked in the 1940s to sing for community events growing up in the Philippines, her mother said. Damasen and her husband, Erwin Damasen, an IT consultant, knew that singing just had to become part of their daughter’s future, which is why they make the trek to Southern California regularly so that she can pursue her acting and singing dreams. 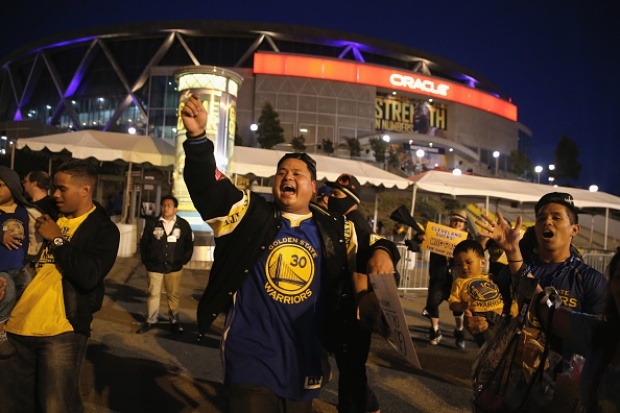 Nayah Damasen, 10, of San Jose is set to sing the national anthem before Game 1 of the NBA Finals at Oracle Arena on June 4, 2015. For now, Nayah is all too thrilled to be caught up in this national moment. And she hopes her part in inspiring the fans and team will help the Warriors capture a title they haven’t earned since 1975.